They ripen during September and October, and will keep until January. Empire was developed at Cornell University in New York state, USA in the 1940s, and its parents are classic old North American varieties – Delicious and McIntosh. These are both shiny red apples. It is an ideal lunch-box apple, not least because it does not bruise easily. Sweet and tart at the same time. Use for fresh-cut slices, candy and caramel apples. Also used in baking. Texture remains very firm, a good storing apple. Popular in Great Britain. 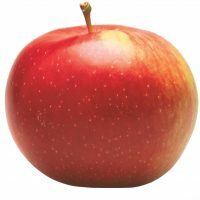 Empire has all the qualities growers look for, easy maintenance, strong well-shaped trees, attractive apples, and heavy crops – no biennial bearing. Although Empire can be stored for a short period, it is best when eaten straight from the tree. It has the characteristic and unusual McIntosh flavor, often described in apple textbooks as “vinous”. Perhaps the best way to describe it is like a hint of melon or pineapple or elderflower.